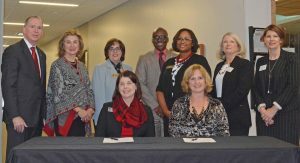 Northern Illinois University Acting President Dr. Lisa Freeman joined Dr. Laurie Borowicz at Kishwaukee College to sign the new RN-BSN agreement between the two institutions. Kishwaukee College and Northern Illinois University recently expanded their academic partnership, announcing a new degree completion option for the Associate Degree Nursing program at Kishwaukee and the Registered Nurse to Bachelor of Science Completion Program at NIU. The agreement will be formally signed and executed by both institutions Wednesday, Jan. 10 at Kishwaukee College. The RN to B.S. Degree Completion is a customized academic pathway between both institutions that allows students to complete the Associate of Applied Science Degree in Nursing Program at Kishwaukee while taking a number of classes at NIU. After graduation from Kishwaukee, students complete final course work at NIU to earn their Bachelor of Science in Nursing degree. As part of this partnership, Kish will facilitate students’ clinical experiences. Additionally, students will be able to sit for the National Council Licensure Examination (NCLEX) after successfully completing the Kishwaukee portion of the program. The trend in healthcare is for an increase in nurses who hold a BSN and this agreement will allow more of our students to achieve that goal in a time- and cost-efficient manner,” said Bette Chilton, Dean of Health and Education at Kishwaukee College. “This is a great step forward for our students and for healthcare professionals in our local hospitals and clinics. For more information, please contact Bette Chilton at Kishwaukee at 815-825-9308 or Amber Davis at NIU at adavis16@niu.edu or call 815-753-6557.